This is one of those bad news/good news situations. The former, first: after a decade-long run, the Salty Tart is leaving the Midtown Global Market. 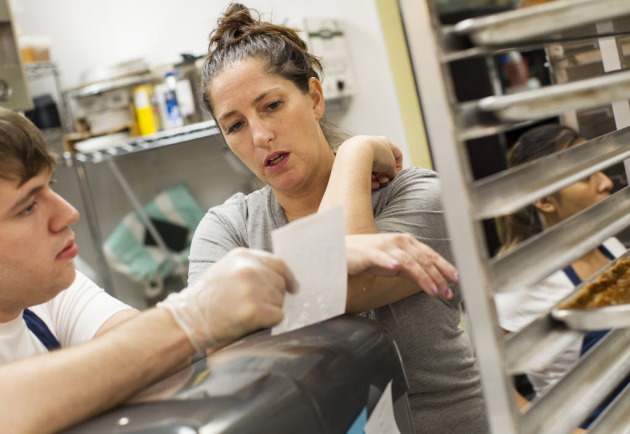 Chef/owner Michelle Gayer (pictured, above, in a Star Tribune file photo) said the Salty Tart’s last day at the MGM is Sept. 30. On a positive note, the plan is to reopen – the next day – at a new location. Gayer is building a retail outpost (literally, with the help of family and friends) in the nearby commercial kitchen she’s been operating for the past year. It’s located at 2940 Harriet Av. S., about a mile to the west of Chicago and Lake. The exit is a loss for the MGM. Gayer is a four-time James Beard award nominee, and her nationally famous bakery has been a high-profile anchor for the market since Gayer sold her first coconut macaroon in the spring of 2008. For the Salty Tart’s first nine years, Gayer and her crew somehow managed to produce croissants, pastry cream-filled brioche, rustic fruit-filled Danish, oatmeal-sour cherry-chocolate chunk cookies, cinnamon-raisin bread and other distinctive sweets and savories out of an MGM space no larger than the bonus room of a Woodbury McMansion. In the spring of 2017, after Gayer opened that roomy commercial kitchen, she transferred production operations out of the MGM, then downsized to a smaller, retail-only footprint. Intown Sushi now occupies the former Salty Tart location, and the bakery’s new MGM counter sits in a much less visible spot. It’s been a busy 18 months for Gayer. Last summer, she launched an outpost at Minneapolis-St. Paul International Airport, and late last fall she opened a Salty Tart bakery/cafe in the Market House Collaborative in Lowertown. She also made an appearance on the Food Network’s “Beat Bobby Flay” (catch it in reruns – it’s season 12, episode 12 -- because Gayer is her hilarious, outspoken self). Let’s just say that Gayer's rendition of banana cream pie appeared to best Mr. Flay’s in every way, but the judges inexplicably thought otherwise.